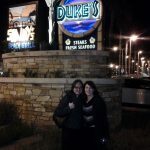 This week, this Allergic Traveler, had the pleasure of eating at Duke’s in Huntington Beach, California. An old friend that I have known for many years joined me. I grew up with Shannon in Montreal. She now lives in California and I am in North Carolina. I was so excited to catch up. It was fun to see a familiar face in a ‘strange’ (to me) city. It was like a sappy movie – we laughed, we cried, we gabbed, and it was perfect – including the food! The eating experience was delightful. I gave the waitress my Allergic Traveler card. She came back to me and thanked me for having a card handy. She proceeded to tell me how she went around and showed the card to all the chefs, cooks and waiters. She was very appreciative of the fact that I was ready and well prepared for a safe dinning experience. She asked me about the company and if I knew anything about it. Well this was my time to shine. I love when people ask me about Allergic Traveler. It helps me bring awareness to the issue and of course it helps promote the company. The support and the appreciation is why I do this. Thank you for your support. Feel free to join our conversation on facebook or twitter. P.S. By the way, the food was delicious and safe! You should definitely check the place out, whether you have food allergies or not.